Eliminate the confusion and mystery out of which pan and pick-up you need to complete your engine rebuild. 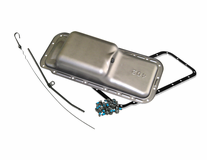 Each kit comes with all the necessary components to button-up the bottom half of the engine. 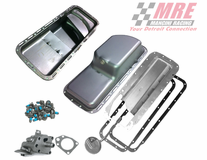 These packages feature top of the line Milodon or Mancini Racing oil pans, pick-up tube, Mopar windage tray, gaskets, bolts and a Melling HV pump.